If 2017’s explosion of cybersecurity breaches taught us anything, it’s that our workforces, more than ever, are one of our most critical defenses. But with as much as 30% of employees unable to spot a phishing email, how do you keep hackers from hijacking your data? The seemingly obvious answer is security awareness training. Unfortunately, many security education programs today fail to sufficiently change employees’ security attitudes, skills and behaviors -- providing a false sense of protection and safety. Even worse, 48% of companies do not have an employee security education program. How can IT security professionals take advantage of Security-as-a-Service to supplement their existing security programs? While cyber-attacks are increasing, your IT budgets and available security staff probably isn’t. You have too little time, too many alerts, and security tools are becoming more expensive and time consuming. Learn how Security-as-Service can add 24x7 coverage and help improve the security posture of your organization. This session will cover the traditional breach reports as well as a new style of reports and analysis. In this session, ExtraHop Deputy CISO Jeff Costlow will discuss how security operations teams can escape the cycle of reactivity characterized by constantly responding to a flood of alerts, and move toward a more proactive stance by using the right data sources and workflows, driven by network traffic analysis, to focus on developing proactive capabilities like continuous encryption auditing, policy auditing, and more advanced use cases like threat hunting. Michael Wylie, Director of Cybersecurity Services, Richey May Technology Solutions. The Zero Trust Architecture model accepts that secure data can no longer be adequately protected by network perimeter firewall design because there is no longer a physical network perimeter to protect. Digital entities (people and things) cannot be trusted until they have been authenticated through integrated digital ID services. High assurance digital identity has quickly become the center of IT cybersecurity. Fortunately, there are several side benefits to solving this security challenge. One key aspect of digital transformation for many companies has been the evolution and rise of the remote user. Application access from any device, anywhere has become an imperative for success, but with transformation comes challenges with attack surface and network vulnerability. Adopting a zero trust model is key to combat cybercriminals who are probing security perimeters and enterprise resources for vulnerabilities with a distinct purpose. Application access and identity is one of the key areas to begin. Join us on ……May 15th at 1pm EST for a discussion with Akamai security professional Faraz Siddiqui as he shares steps you can take to protect your network against breaches by evolving access policies and solutions. This year saw IPv6 adoption worldwide surpassing the twenty-five percent mark. While previously only used by some innovative attackers, the incentive to explore the space for fresh targets grows as more than a quarter of the Internet is now IPv6-capable. Many organizations are challenged with adequate monitoring their IPv6 networks, misconfigured devices and a shortage of time to implement IPv6 best practices. Chad Anderson, Research Engineer, DomainTools, LLC. The world is changing, attacks come at the speed of light, and are changing so fast detection is almost impossible. So, how do we tell when we are being attacked? What new technologies are coming down the pipe? This session will cover these and many more topics. Today’s SOC teams are struggling to gain efficiencies that are grounded by the limitations of legacy, on-premise technologies. As a result, organizations are turning to cloud-based solutions to offer the flexibility and scalability they need to keep pace with the modern threat landscape. It is critical that we explore the difference between cloud-native and cloud-based security operations center (SOC) technologies. From ensuring that you gain the performance and simplicity your team needs to fully leverage big data analytics to understanding the role that third party integrations will play in your evaluation, we’ll leave you thinking about the questions to consider as you evaluate new SOC technologies. Brian Engle, CISO, Managing Director CISO Advisory, CyberDefenses, Inc.
Cyber hygiene is the flossing of cybersecurity — something we all know we should do, but regularly ignore. While it may be more exciting to get the latest silver bullet to solve a zero-day problem, improving processes to better leverage what you already have will go further in protecting against the next cyberattack. Kelly Roberston, CEO, SEC Consult America, Inc.
A number of digital transformation initiatives are forcing businesses to rethink their enterprise security architecture. With breaches on the rise, users increasingly mobile, and data and applications moving to the cloud, businesses have to consider whether traditional perimeter-based security approaches are relevant. Over the past few years the focus has shifted from ‘does the code have vulnerabilities?’ to issues of ‘could the code have vulnerabilities?’. Of course the later created the question – How would we know? Now, just when we thought we understood things, we realize that we are changing again. Not only is the code and its components are important, but so is the question of the development environment. This webinar will go cover the state, changes, and new directions we are being faced with. James R. McQuiggan, Product & Solutions Security Officer, Service Americas Division, Siemens Gamesa Renewable Energy. 2018 was worse than 2017 for cyber security. This year every month was filled with even more major breaches, hacks, and attacks surfacing then 2017. The nature and range of the attacks varied from email hacking to zero days, from minor incursions to (potentially) everyone’s data being stolen. 2018 will probably go down as the new worst year for Cyber Security with all the previous year’s events having been far surpassed. Even our doom and gloom or same old same old predictions of last year have been blown away. The question now, will 2019 bear the full weight and impact of the events of 2019, or will it have its own harrowing events. Will the growing impact and occurrences spotlight security and translate in terms of media and regulatory attention? What kinds of threats will dominate the 2019 landscape? Join us, make notes, and then check back in a year to see how our panel of experts did in providing insight and making predictions for the 2019 challenges to InfoSec. 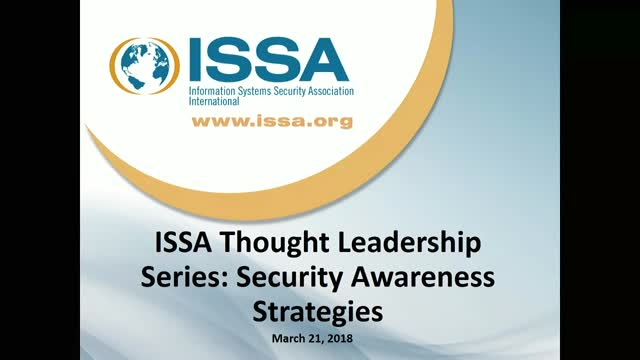 ISSA is the community of choice for international cybersecurity professionals dedicated to advancing individual growth, managing technology risk and protecting critical information and infrastructure.